The name of the genus is derived from the Latin adjective crocatus, meaning saffron yellow. Saffron is a spice derived from the flower of the saffron crocus (Crocus sativus), a species of crocus in the family Iridaceae. The word Crocus is Latin for Saffron. The flower's three stigmas (the distal ends of the plant's carpels, or female reproductive organs) and parts of its style (a stalk connecting the stigmas to the rest of the plant) are often dried and used in cooking as a seasoning and colouring agent. Crocus is the native of Southern Europe and Asia. There are about 80 species of crocus, of which approximately 30 are cultivated. These cup-shaped, solitary, salverform flowers taper off into a narrow tube. Knowing this, it should not surprise you that Saffron comes from the stigma of the Saffron Crocus. But, it takes thousands of flowers to get an ounce of Saffron. Saffron, which has for decades been the world's most expensive spice by weight, is native to Southwest Asia. It was first cultivated in the vicinity of Greece. The spice saffron is obtained from the stamens of Crocus sativus, a fall-blooming species. The hay saffron (Crocus sativus L.) is a sterile triploid plant, known in human culture only, with no fertile seeds produced. The origin of saffron is still a mist, however it is assumed to be an autopoliploid mutant or a hybrid. The recent classification and most of the former taxonomic publications define C. sativus to be derived from C. cartwrightianus, a wild species. Saffron is considered to be the worlds most expensive spice. 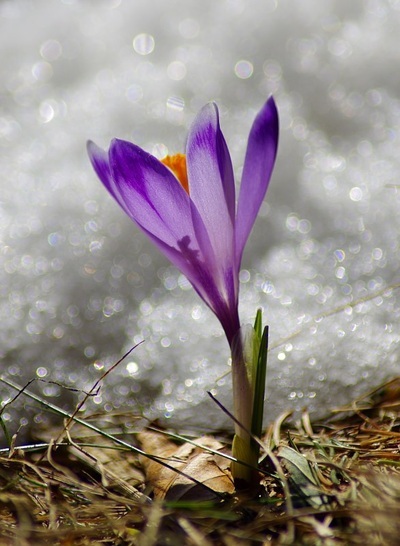 The flower of Crocus sativa is a light purple, but it is the thread-like reddish colored stigma of the flower that is valued both as a spice and as a natural colorant. Saffron is hand harvested in the autumn, and the stigma is laboriously separated to yield the reddish colored spice. It takes in excess of 70,000 flowers to yield just one pound (0.45 kilo) of saffron spice. The odour of saffron is sometimes described as like the sea air. Saffron is characterised by a bitter taste and an iodoform- or hay-like fragrance; these are caused by the chemicals picrocrocin and safranal. It also contains a carotenoid dye, crocin, that gives food a rich golden-yellow hue. These qualities make saffron a much sought-after ingredient in many foods worldwide. Saffron also has medicinal applications. The word saffron originated from the 12th century Old French term safran, which derives from the Latin word safranum. Safranum is also related to the Italian zafferano and Spanish azafr?n. Safranum comes from the Arabic word asfar , which means yellow, via the paronymous za?faran , the name of the spice in Arabic. In the Greco-Roman classical period (8th century BC to the 3rd century AD), the saffron harvest is first portrayed in the palace frescoes of Minoan Crete, which depict the flowers being picked by young girls and monkeys. 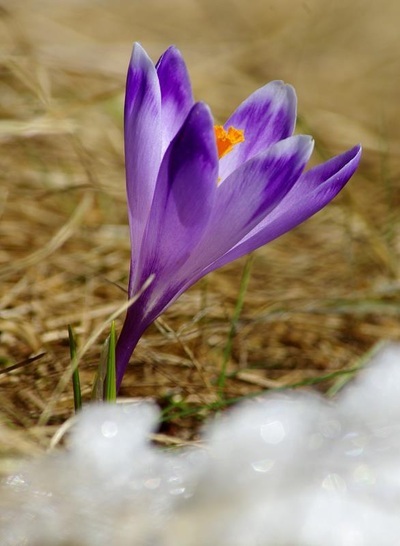 The best-known Greek legend involving saffron was that detailing the tragedy of Crocus and Smilax. The people best known as growers of this bulb were the Minoans. The Minoans grew it throughout its range in the Aegean Sea and the parts of Asia Minor which they controlled. It was produced by crushing the dried stigmas of the flower for the powder. The stigma is the female part of the flower which is surrounded by the male stamens. 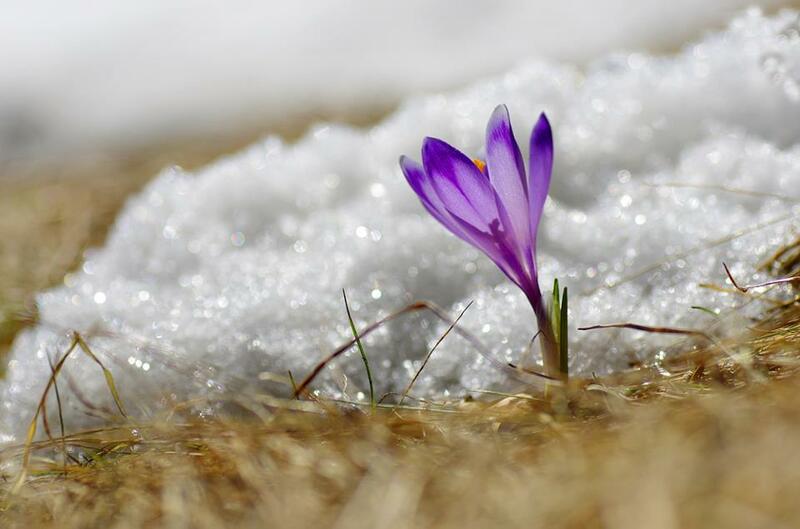 According to a theory, after ancient Persia conquered Kashmir, Persian saffron crocus corms were transplanted to Kashmiri soil. The first harvest then occurred sometime prior to 500 BC. Phoenicians then began in the 6th century BC to market the new Kashmiri saffron by utilising their extensive trade routes. Once sold, Kashmiri saffron was used in the treatment of melancholy and as a fabric dye. Saffron-based pigments have been found in the prehistoric paints used to depict beasts in 50,000-year-old cave art in what is today Iraq. Later, the Sumerians used saffron as an ingredient in their remedies and magical potions. The flowers of the Crocus Autumnale arise on leafless stalks from corms in early fall and can be white, pink, lavender, or purple. The tulip-like leaves follow a few weeks later and last until early summer. This is a highly poisonous plant, so don't confuse it with Crocus Sativa. This Crocus is the most cold tolerant. Winter and Spring Flowering Crocus: These are the earliest bloomers, Ex: Snow Crocus, or Crocus chrysanthus. 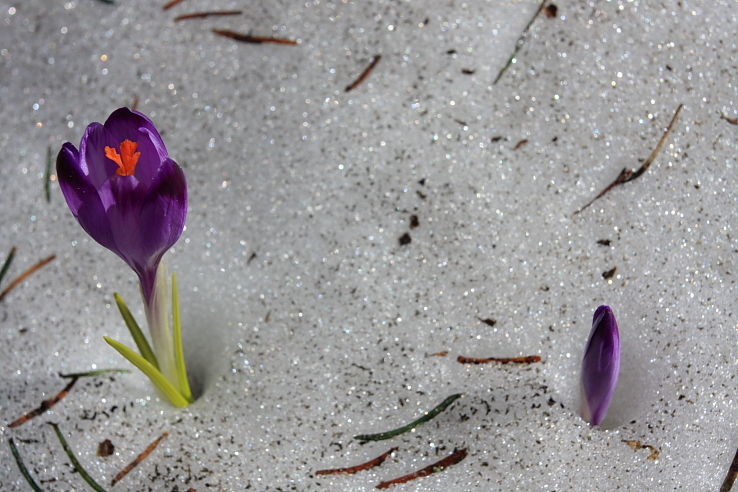 Snow crocuses get their name, as they are the earliest of spring flowers. The Dutch Crocus, or Crocus vernus, sports the largest blooms of all the Crocuses, and is probably the most popular variety of this versatile plant. The stigma of the plant Crocus sativus L., commonly known as saffron is used in traditional medicine as an aphrodisiac, antispasmodic and expectorant.1 Recent pharmacological studies have demonstrated that saffron extract has antitumor2-4 and hypolipidemic effects5 as well as radical scavengering and learning or memory-improving properties. Though some true crocus bloom with the fall rains, after summer's heat and drought, Autumn crocus is a common name used for Colchicum, which is in the lily family (Liliaceae), and which has six stamens; it is also (confusingly and incorrectly) known as Meadow saffron. The so-called Prairie crocus (formerly Anemone patens, now Pulsatilla patens or P. ludoviciana) belongs to the buttercup family (Ranunculaceae). Saffron has a curiously distinctive flavor, but fresh from the fall flower it smells sweet, of freshly cut hay, and feels like waxed thread. The popular Autumn Crocus or Colchicum Autumnale is actually not a true Crocus and is a member of the Lily family. The two can be differentiated in that true Crocus has 3 stamens and Crocus Autumnale has 6. This is a highly poisonous plant, so don't confuse it with Crocus Sativa. Poisoning symptoms are similar to arsenic poisoning. Saffron Crocus do best in full sun and well-drained soil that is moderately rich in organic matter. Ideally, the site should be relatively dry in summer, when the corms are dormant. Plant the corms 4 inches deep and 4 inches apart. Heavy fertilizing is not necessary; apply a light dusting of bone meal or 5-10-5 fertilizer on the soil each fall so that it can work in during the winter months. Flowers will appear the first fall after planting (generally in September or October) and last for about 3 weeks. The grass-like leaves may emerge soon after the flowers or wait until the following spring. In either case, the leaves persist for 8-12 weeks, then wither and vanish, leaving no trace of the corms below until the flowers appear again in fall. Propagation is by natural increase of corms, which multiply rapidly in rich soil. Once planted, Crocus will look after themselves, and come up flowering year after year. If planted in the borders, the treatment given to the other plants will benefit the crocus, but no individual treatment is needed. Bulbs planted in the lawn must be allowed to die down naturally after flowering, before mowing over them. This is not normally a problem provided they are situated in groups rather than random scatterings.